The last three years, Yuroz continues to morph his work across mediums by incorporating iconography to devise a new speak that celebrates the human spirit in a higher magnitude. As a sequel to his 2016 limited edition release of the first ICONO serigraph “Dance with the Pomegranates”, today, Yuroz announced his 2019 ICONO Serigraph Diptych Release, “From Dusk Till Dawn”, with a limited edition of 45. “Mythological Renaissance paintings revived and developed iconography with its own conventions. 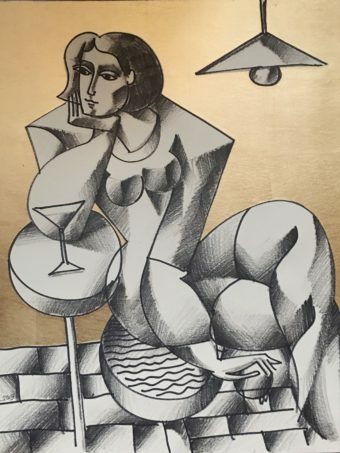 I was drawn to the incredible sense of balance between a palette of basic colors and the multi-dimensional coalescing of simple lines, curves and shades,” commented Yuroz. 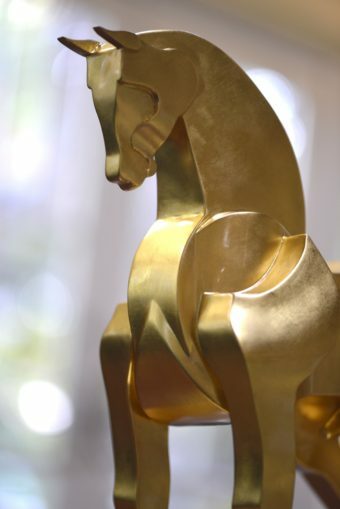 The ICONO Collection was conceived to celebrate ourselves and people in our daily lives, with the elegance and importance accentuated by the glamour from this genre. Yuroz wants viewers to find something in this body of work to connect with. It could be that one sparkle, one memory, one yearning or one moment shared that was otherwise overlooked. 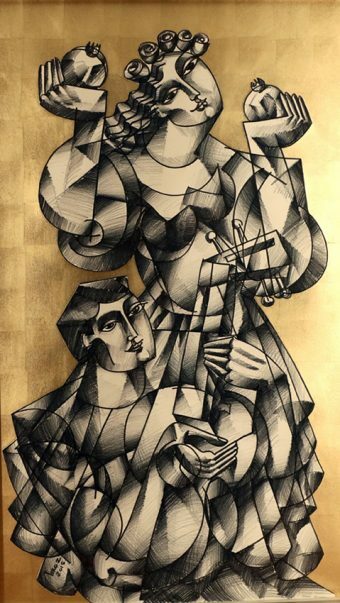 This 2019 ICONO Collection Serigraph diptych release added the luster of 23K gold leaf to the architectural composition of the original charcoal drawings. The watercolor hints the romanticism sometimes overlooked in everyday life. 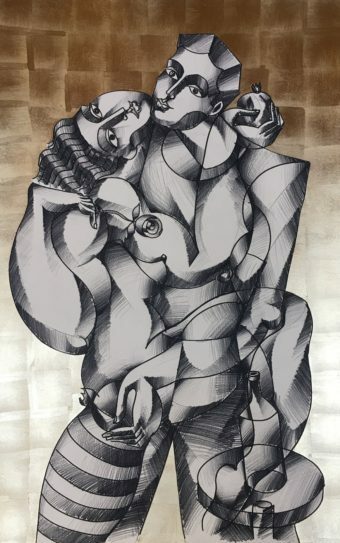 With the flattened images presented by the artist’s soft cubist rendering, this limited release is Yuroz’s latest invitation to his viewers to find elements represented in this couple to connect with, to celebrate our special moments. 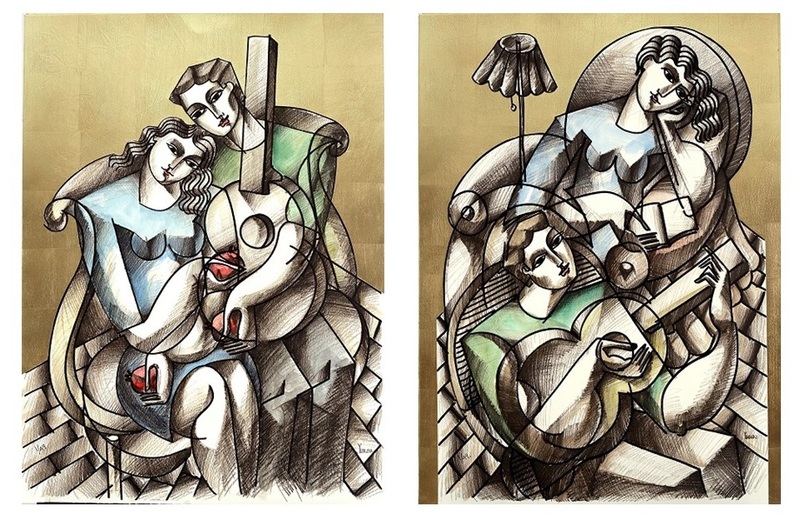 “From Dusk till Dawn” was derived from a Yuroz original charcoal diptych, where the artist celebrated life’s sweetness when two lovers connect before day breaks (represented in “Lovers with Guitar and Pomegranates”), and relax after nightfall (represented in the “Sweet Serenade“). They share this eternal path of joy and love of life and for each other as they exchange their heart songs. 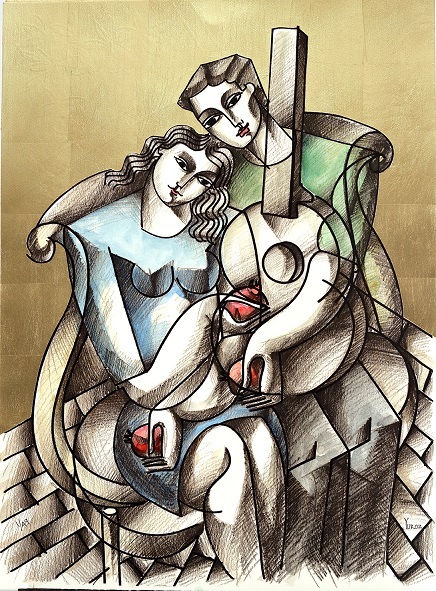 “Lovers with Guitar and Pomegranates”) is a touching representation of timeless love. The man opens his chest with a tender embrace while serenading his lover as he fuses his love into hers. Engulfing his lover into a protective cradle, he caresses her curves while tugging his lower body in accord with hers. 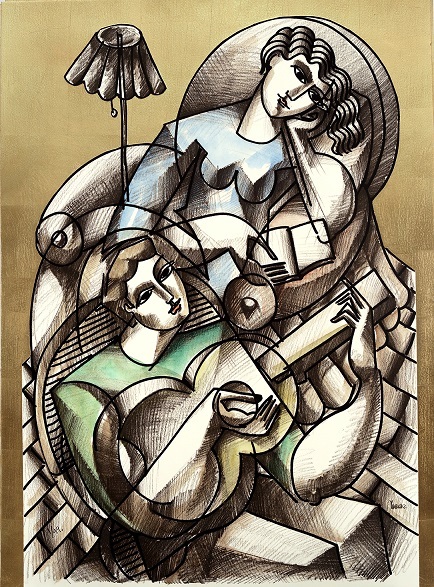 “Sweet Serenade“ depicts a couple reconnecting at day’s end. She lays open her book without words and he serenades her with his guitar with no strings. They both want this moment of intimate togetherness to last forever as they connect in quiesce. The subtle embellishment in water color by Yuroz in both pieces adds warmth to the representation and puts viewers one step closer to feel the lovers’ yearnings. This entry was posted in Collections, Press Release and tagged ICONO Collection, ICONO Serigraphs, Serigr.